Challenges Action: Kneel Mole's Town to choose a character without gold. Move 1 gold from Mole's Town to that character. Then, that character cannot be declared as an attacker until the end of the phase. 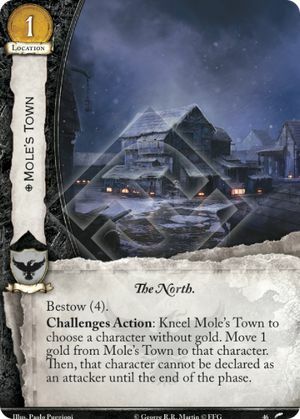 If Mole’s Town is canceled (ex: Treachery), the gold is not removed from Mole's Town (because it's not part of the cost but rather the effect).